Because this site accidentally turned into a 24/7 Jeff Francoeur site last winter, I think it’s only appropriate that I contribute to the Royals’ campaign for him to be an All Star this summer. Some people say that you can use numbers to say anything. I’m trying to make the numbers say that Jeff Francoeur is an All Star. It is…not going well. Maybe excessive exclamation marks will help. Frenchy is 4th in the league in plate appearances among RFs! He is tied for 3rd in hits! He is 3rd in home runs! He is 6th in runs scored! He is 3rd in RBIs! He is 3rd in stolen bases! He is 3rd-worst in OBP, but that’s OK because that stat is not on the scoreboard! Yeah…this isn’t going to work. All those numbers were just among AL right fielders. 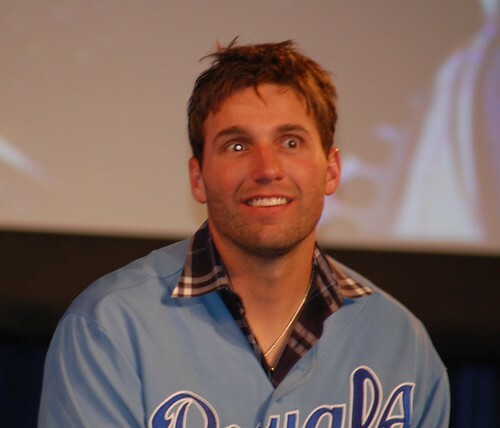 If the All Star Game is supposed to highlight the best players in the league, Francoeur would not be the right choice. He’s not among the best outfielders in the league, and he’s not even the best outfielder on his own team. Obviously, the ASG doesn’t matter a whole lot to Royals fans. It doesn’t much matter whether our league or the other one has home field advantage in the playoffs, because that won’t be the Royals. We’ll get our token representative, and some of us will completely ignore the ASG and lament the lengthy absence of real baseball. But for those who do care, the time might be nearing when Kansas City has multiple legitimate options to send to the host city. That could even be next year, when the host city is at home. Until then, I’ll just roll my eyes at the marketing material in my inbox touting Frenchy as an All Star. And put up more pictures of his scary, scary eyes. Problem is, who SHOULD be the Royals’ All Star this year? Every team gets one, after all. Soria used to be the default choice, but that’s kinda out the window…I supposed if Crow closes well and keeps his numbers down like they are maybe he gets to go? Alex Gordon? I know the disappointment of his first few years is hard to look past, but he really is having a really good year – 2.0 WAR and counting. As I said, Frenchy’s not even the best player in his own outfield. Too bad Hosmer has only played 24 games, or I’d go with him. A while since we heard from you Minda – been missing you! Feeling better? What if Hosmer stays on a roll… Or I could see Billy being the token Royal – and getting a token at-bat in the 6th inning. Glad to know I’ve been missed. :) I’m feeling a bit better, but with my new internship in California, I’ve been CRAZY busy. Hopefully I’ll find time to post throughout the summer here. I think the fan vote for ASG participants kind of negates whether a player is the best at a particular position. I don’t get the feeling that fans look closely at the stats when voting. But if he gets in, good for him. Pffff, fans are totally the smartest people out there!